Crowns and Bridges - Thousand Oaks, CA | Jennifer L. Graves-Nagel, D.D.S. Crowns can also be used to create a lifelike replacement for a missing tooth. 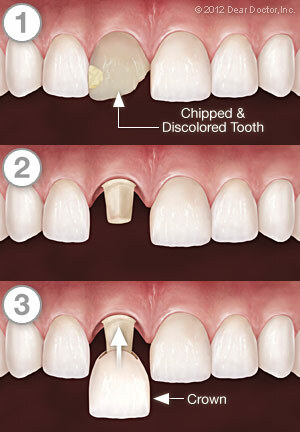 This is done with bridgework, which spans the space of the missing tooth and requires at least three crowns. Two of those crowns will be placed over healthy teeth on either side of the missing tooth; these healthy teeth are referred to as abutment teeth. The two crowned abutment teeth become supports for a third crown placed in between them; that third crown is referred to as a pontic. 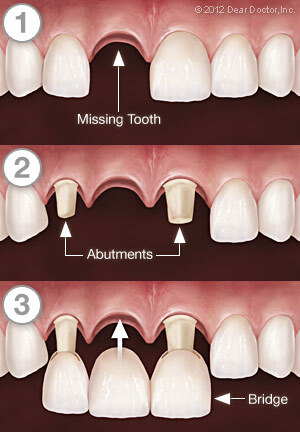 If more than one tooth is missing, more crowns will be needed to bridges the gap in between the abutment teeth. For more information on Crowns & Bridges in the Thousand Oaks, CA area call Jennifer L. Graves-Nagel, D.D.S. at (805) 557-0100 today!